Atlanta, GA (RestaurantNews.com) Chick-fil-A® is awarding more than 5,700 Team Members $14.5 million in scholarships. The investment in this year’s program marks a $5.7 million increase since 2017 and is the one of the highest unrestricted per-employee scholarship investments in the industry. Team Members who are beginning or continuing their higher education will be awarded scholarships in the amount of $2,500 or $25,000. Chick-fil-A’s “Remarkable Futures” education initiative allows students employed by the company’s local franchise Operators to receive up to $25,000 in scholarships that can be applied for any area of study at any accredited institution of their choice, including any two- or four-year colleges and universities, online programs or technical/vocational schools. There is no requirement of hours worked or length of service to qualify. In addition to $14.5 million in scholarships, all of Chick-fil-A’s 120,000 Team Members also have access to tuition discounts and other educational benefits at 100 colleges and universities nationwide. Chick-fil-A Leadership Scholarship: In 2018, 5,728 students will receive a $2,500 scholarship for the 2018-2019 academic year. Team Members may re-apply for up to four years – for a potential total of up to $10,000 for college while working at a Chick-fil-A restaurant. These scholarships are awarded to Chick-fil-A Team Members based on leadership, academic achievement and community involvement. True Inspiration Scholarship: In 2018, 13 Team Members will receive an individual, one-time award of $25,000. These scholarships will be awarded to Chick-fil-A restaurant Team Members based on demonstrated financial need, leadership, academic achievement and community involvement. This year’s True Inspiration Scholarship recipients have logged an average of 450 hours of community service each. Educational Assistance Opportunities: In addition to scholarships, Chick-fil-A is offering all Team Members access to tuition discounts of up to 30 percent and other educational benefits at 100 colleges and universities across the country. The benefits can be combined with either of the above scholarships. To be eligible for these opportunities, applicants must be employed by a Chick-fil-A franchise Operator, a Chick-fil-A, Inc.-operated restaurant or an S. Truett Cathy (STC) brand restaurant. Chick-fil-A, Inc. began awarding scholarships to team members in 1973 based on founder S. Truett Cathy’s desire to incentivize team members to further their education. 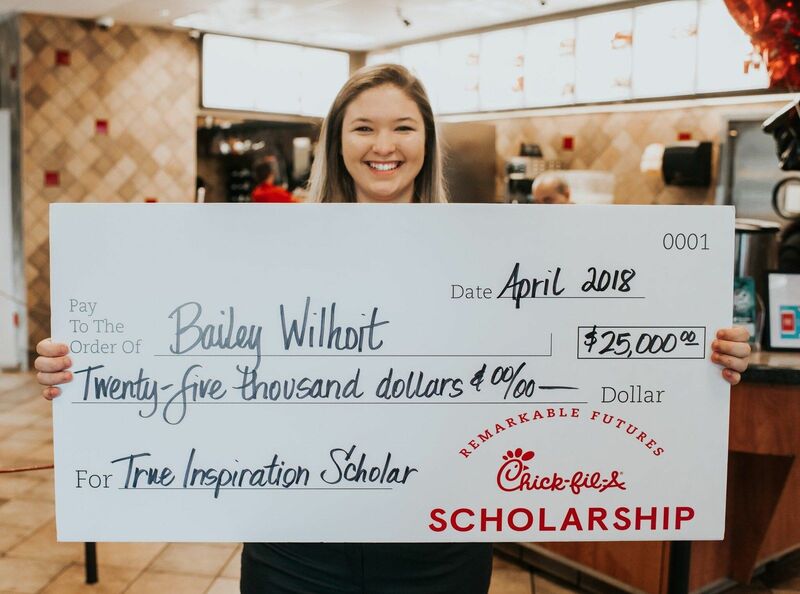 Since then, nearly 46,700 Team Members have received scholarships from Chick-fil-A, Inc., bringing the total amount funded to more than $60.5 million, and applied at more than 3,000 schools nationwide. Atlanta-based Chick-fil-A, Inc. is a family owned and privately held restaurant company founded in 1967 by S. Truett Cathy. Devoted to serving the local communities in which its franchised restaurants operate, and known for its original chicken sandwich, Chick-fil-A serves freshly prepared food in more than 2,200 restaurants in 47 states and Washington, D.C.
Chick-fil-A reported over $9 billion in revenue in 2017, which marks 50 consecutive years of sales growth. A leader in customer service satisfaction, consumers voted Chick-fil-A, Inc. #4 in Harris Poll’s annual corporate reputation survey, ranking the company 4th out of 100 in 2018. Chick-fil-A was also recognized for customer experience again in the 2018 Temkin Experience Ratings survey, was named “Best Franchise Brand” in 2018 by Airport Revenue News and was named one of the top 100 best places to work by Glassdoor in 2017. Continuing its founder’s legacy of generosity and service, in 2017 the company’s philanthropic Chick-fil-A Foundation awarded $1.23 million to 23 not-for-profit organizations across 13 states through the True Inspiration Awards and almost $9 million in scholarships to restaurant Team Members nationwide. More information on Chick-fil-A is available at www.chick-fil-a.com.